Do you know you need to focus more on Google+? Are you having a hard time building your community on Google+? In this article I’ll tell you about 3 tools to build your presence on Google+ and get more value for your business. Friends+Me automatically shares content from Google+ to other social networks by checking your Google+ business page and/or personal profile at regular intervals. If new posts are found, they’re reposted to any social networks you’ve associated with Friends+Me. Friends+Me has some excellent configuration options available, but you’ll need to spend some time setting them up. Once that’s done, Friends+Me is a robust way toshare your Google+ updates across multiple platforms. Sharing from Google+ to Twitter brings more traffic to your Google+ account. 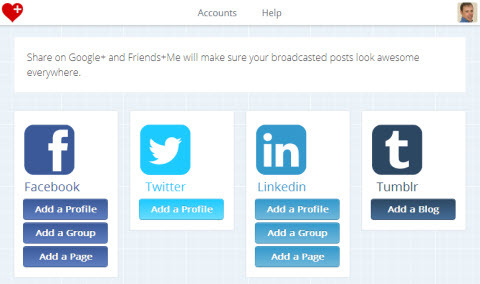 Connect your established social platforms—Friends+Me supports Twitter; Facebook business pages, groups and personal profiles; LinkedIn profiles, groups and pages; and Tumblr public pages and private blogs. Selectively publish—You may not want to publish your content to all social networks, so you can append specific hashtags (discussed a little further down) to indicate which platforms you want to share with. Integrate bit.ly tracking links—You can share content using either the Friends+Me web address shortener or you can use bit.ly. 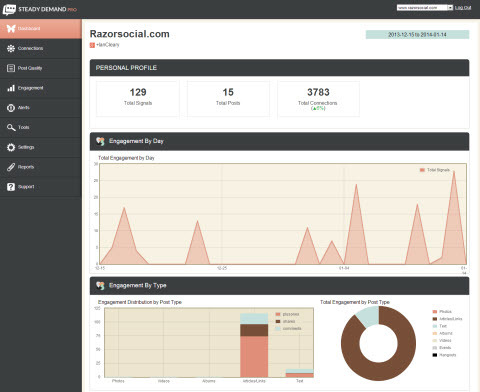 Both link shorteners let you track how your audience responds to your linked content. 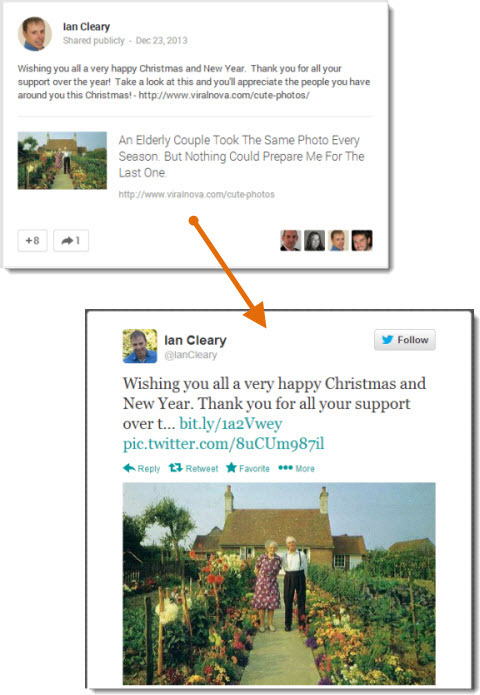 Include Twitter inline images—When you attach a picture to your Google+ update, it’s visible on Twitter as well. Since visual content is a major part of community engagement, definitely try this feature and see how your fans react. Here’s an example of a Google+ update reposted to Twitter. As you can see, the tweetincludes a link back to your original Google+ update and the image shows up inline. When you launch Friends+Me, you’re asked to connect your Google+ business page or personal account. Then you can connect your other networks. Add your Facebook, Twitter, LinkedIn or Tumblr accounts to Friends+Me. The Google+ page you link to Friends+Me is your source network. Content you publish on your source network is copied to your destination network(s) (i.e., Facebook, Twitter, LinkedIn or Tumblr). In the example below, I selected a LinkedIn profile to connect. 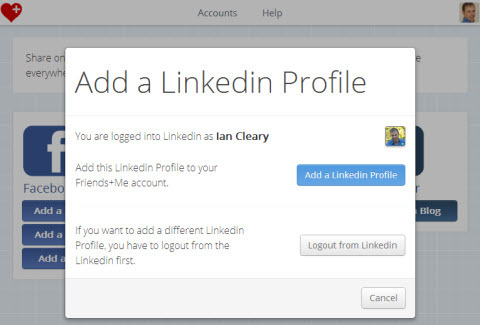 Friends+Me recognizes whether you’re already logged into LinkedIn, and all you have to do is click the button to add a LinkedIn profile. Connecting my LinkedIn profile to Friends+Me. What I like about Friends+Me is that you can schedule each platform to share your Google+ updates at different times so you aren’t inundating your fans with the same information all at once. For example, you can schedule LinkedIn updates to go out in the morning while Twitter updates go out in the afternoon. 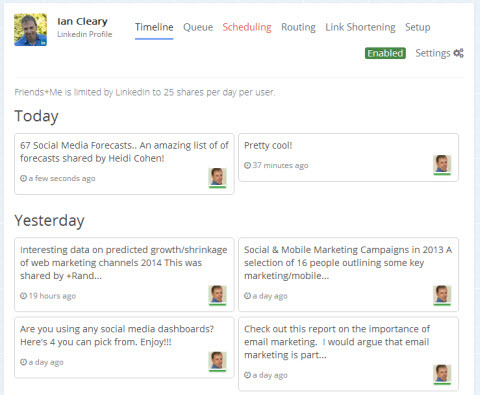 Each social profile has its own set of menu options for scheduling. By default, Friends+Me posts your content to all of the social profiles you connect. However, there may be times when you don’t want to share with a specific platform. Friends+Me uses specific hashtags that allow you to share only with the platforms you want. For example, you can include #f so that content is only republished to Facebook or #ft to republish content to Facebook and Twitter. This Google+ post will only be reposted to Twitter. Timeline—The timeline shows the updates you have recently posted on Google+ that were reposted to a network (e.g., LinkedIn). You can click on each update to bring you to the actual post in Google+. Queue—Any items that are in the queue will be published at the time set in the Scheduling section. If you don’t have automatic scheduling enabled via the Scheduling screen, then any new Google+ posts are placed here in the queue. You can either post those immediately or manually set a posting time for each update. Scheduling—This section is where you set up your sharing schedule. You can specify that posts be sent to a social network at a specific time interval after the original update is published (e.g., 30 minutes later). You can even set it up so updates are reposted on specific days and times. For example, in the screenshot below, the Google+ updates are scheduled to be reposted to LinkedIn on Monday, Wednesday and Friday at various times during the day. Schedule your Google+ update to share on specific days of the week. Routing—This section lists the Google+ pages or profiles you want to share updates from. So if you only want posts on your personal Google+ profile to be reposted to LinkedIn, you would specify it via the Routing screen. You’ll also see which of your accounts aren’t currently connected to Friends+Me. Link Shortening—By default, Friends+Me uses its own link shortener so any links you share will have fplus.me as part of the link. You can change this to bit.ly if you prefer. 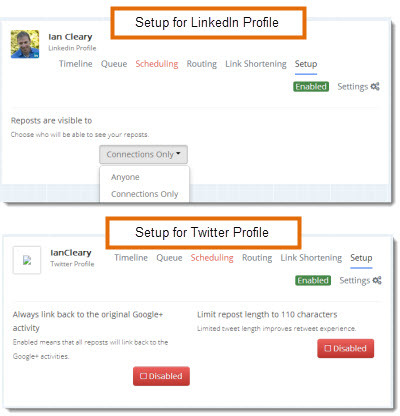 Setup—The setup options depend on the social profile you are configuring. Each platform has parameters you can specify. For example, if you’re setting up Twitter, you can specify a character limit (e.g., 110) to allow room for retweets. A great feature is you can tell Friends+Me to always link back to your Google+ update instead of the original post on the web. Different setup options for each profile type. Friends+Me is a useful tool to share original content from Google+ because you have total control over how, where and when content is shared. While you usually want to share company news via your Google+ brand page, there may be times you want to schedule it to go out via your personal profile too. Unfortunately, the usual content management tools can’t do that. Chrome, the Google web browser, has a plugin that solves that problem: Chrome Do Share plugin. There’s one catch: Your computer must have the Chrome browser open at the time you want the content delivered. This is because the Do Share plugin runs directly on your computer and the posts you schedule are stored in your browser. When the scheduled share time arrives, the posts are sent to Google+. If Chrome isn’t open, you’ll have to reschedule the posts. 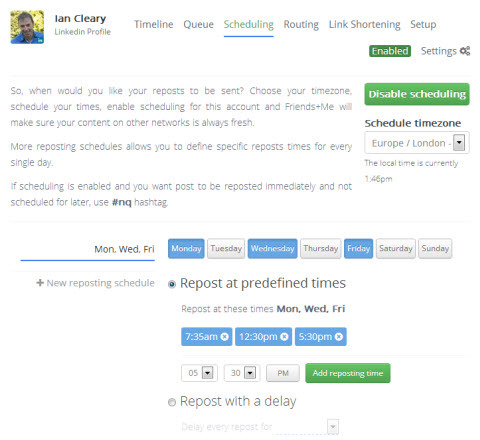 Schedule content to update to your Google+ personal profile and/or your business profile. Schedule content you find while you are browsing through Google+posts. This is an extra option added to Google+ posts so you can schedule delivery of this content at a later time through Do Share. Open the Chrome browser, then search the Chrome web store and add ‘Do Share’ as an extension on your browser. The Do Share plugin is available through the Chrome store plugin directory. Once it’s installed, access it by clicking on the Do Share button in the browser toolbar. 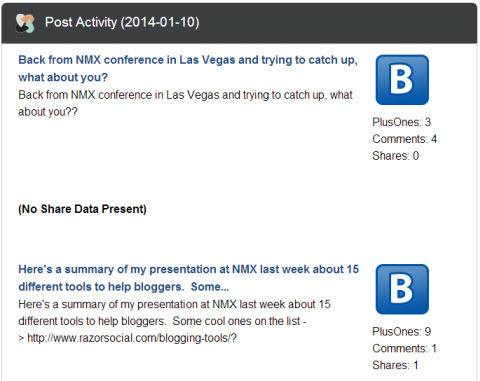 The plugin adds a button to your browser toolbar that allows you to add content to Do Share. In the screenshot above, you can see that the number in the box is zero. That means you don’t have anything scheduled. That number changes as you schedule posts. When you click the button, it gives you the option to create a post with a link to the current webpage. For example, if you’re on a post on the RazorSocial site and click the Do Share button, a new tab comes up with all of the things you need to create a new Google+ post that automatically has a link to the RazorSocial page you’re viewing. Just click on the Share option next to the link to retrieve and display details of the post, then schedule it. If you want to add this post to your schedule, just click on the Share option to the left of the link. This presents a snippet preview of how the post will look on Google+. Add in the title and description and schedule. Specify a title. The title appears in bold on the first line of your Google+ post. Enter the details of your post, and make a comment about the link you’re sharing. Mention and add people to your post. When you add people, they are notified and it can be a good way of catching someone’s attention. Create a poll, add an image or add a link to your post. Publish your post immediately or schedule it for later. Friends+Me and Do Share have different strengths. What’s nice is that they work well together. You can share content via Do Share and then Friends+Me will pick up that content and share it out to the social networks you have configured. If you want to schedule and share content to your Google+ personal profile, Do Share is your solution. It’s easy to use, gives you control of what’s shared and works well with Friends+Me. The only downside is that you can only use it with Chrome. Steady Demand is a Google+ audit and analytics tool. The audit is free; the analytics tool is paid. To use the audit tool, go to Steady Demand and click on Launch Tool to reach the audit page. 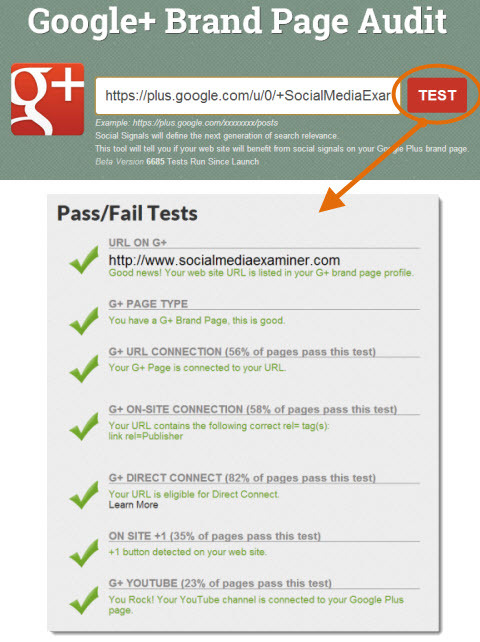 Enter your Google+ brand page URL and click TEST. The results show you an overview of what’s working on your page and what’s not. Enter your business page to get an audit to see what’s right or wrong with your page. If two out of the three criteria are met, the post passes. 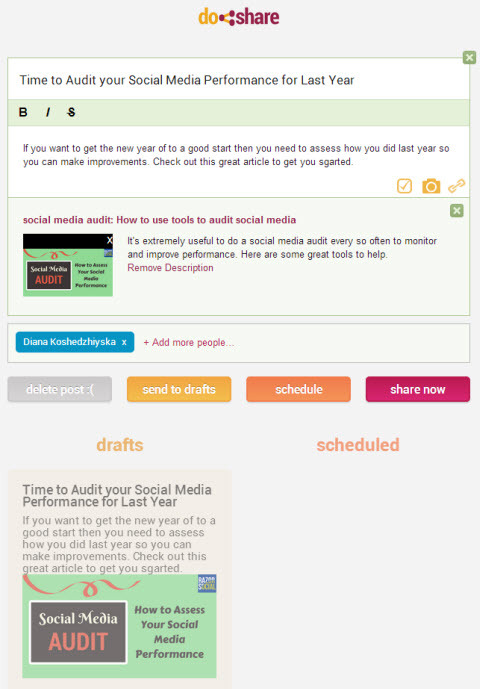 Posts that have (and haven’t) satisfied the audit criteria. Steady Demand Pro provides detailed analytics on your Google+ business page. Dashboard—Your dashboard is a quick view of your overall performance analytics. Post Quality—Steady Demand reviews individual posts and assesses their quality, then provides recommendations for improvement. Engagement—You can see the details of engagement on specific posts. Alerts—Steady Demand warns you if an update has low engagement. To set up your Pro account, all you need to do is go to the Steady Demand Pro pageand click Start Trial. Once you fill out your account information, you can enter your Google+ business page or personal profile details. You can also add competitors’ profiles/pages so you can compare performance and see what is working well for them. The Steady Demand dashboard gives you a quick look at overall stats. Connections by Day shows the growth or decline of the number of circles you are part of and the followers broken out by day. Look at growth or decline in circles you are part of or of followers. When you click on a particular date, you can see that day’s posts and evaluate why there was growth or decline on that day. View all post activity related to your posts on a particular day. 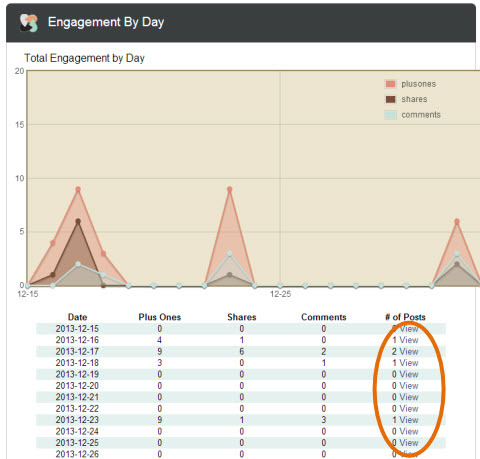 Engagement by Day shows each post’s individual engagement rate. Select the View option to see whether the actual post had good or poor engagement. View engagement on each individual post and then go directly to the post. 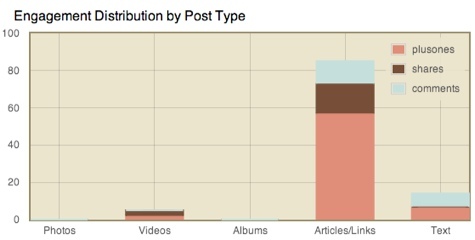 Engagement Distribution by Post Type shows how your community responds to different post topics. For example, in the chart below, Articles/Links–type posts get good engagement and get more +1s than shares or comments.To get this most out of this metric, be sure you’re posting a similar number of different kinds of posts. For example, in this chart you would think that video posts are not very popular and don’t get much engagement, but the truth is we just didn’t have very many video posts, so it’s hard to tell. View a breakdown of engagement by post type. 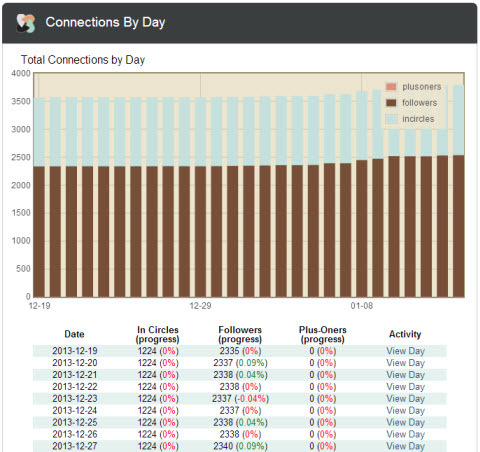 Post Engagement by Time of Day lets you see what works and when. You can also see what time of day you are not posting. Experiment by posting at those times to see if you get higher engagement. 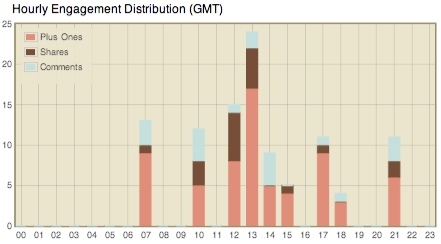 Figure out what time of day gets the most engagement. 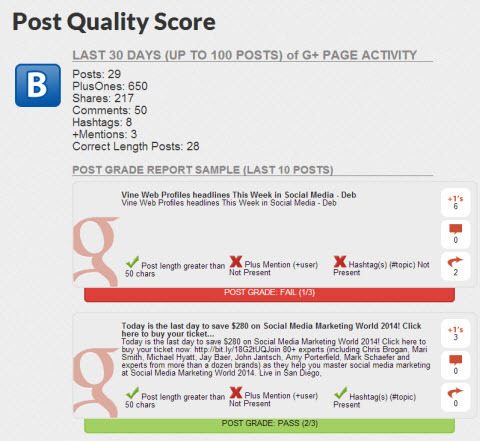 Post Quality Breakdown is an assessment based on how many people recommended your Google+ updates. 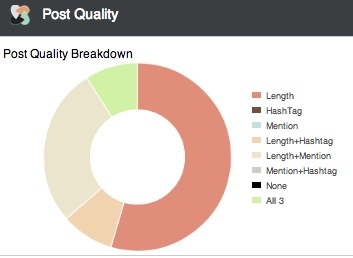 Steady demand recommends your posts have at least 50 characters, include a hashtag and mention someone. The following illustration shows that the posts don’t have any mentions, so this is an area to focus on. Analyzing the Post Quality chart will give you some ideas for improvement. Steady Demand gives you an idea of your current Google+ success with its free audit. To really dive in and improve your Google+ presence, you need a Pro account with full analytics reporting—which includes monitoring your competitors. By watching your competitors, you can evaluate what’s working for them and adapt your own strategy as needed. As expected, Google is integrating Google+ efforts into its suite of tools. It’s more important than ever to establish a presence there. It may take some effort to build your community on Google+, but the tools in this article will get you on the right track. What do you think? Is Google+ working for your business? Tell us what tools you’re using to get an edge.